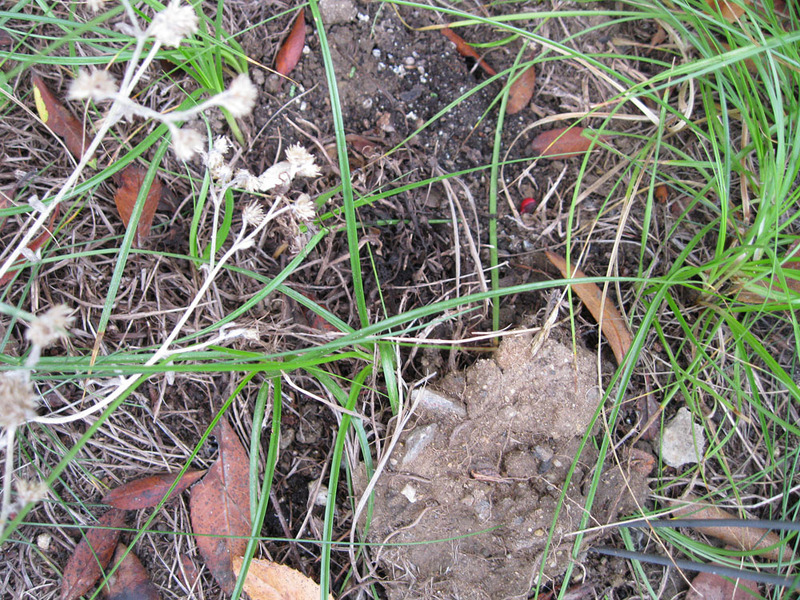 Seeds are germinating, bulbs are emerging, but very few flowers can be found in early December. So we were pleasantly surprised to see our Sourberry (Rhus trilobata/Rhus aromatica) coming into bloom, just in time to be our Plant of the Month. The scientific name is pronounced roos try-lo-BAY-tuh (roos air-oh-MAT-ih-cuh). Sourberry is known by a number of common names including Three-lobe sumac, Three-leaved sumac, Basket bush sumac, Oak-leaf sumac, Skunk bush and Lemita. 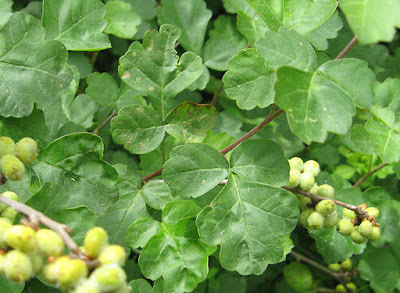 It belongs to the same genus as our common Lemonadeberry (Rhus integrifolia) and Sugar bush (Rhus ovata). 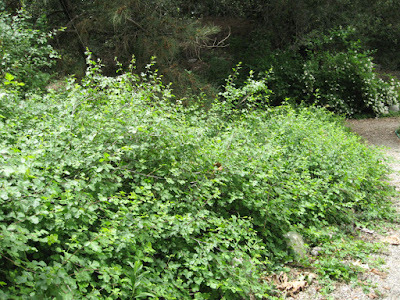 It’s a ‘cousin’ to the local Laurel sumac (Malosma laurina) and Poison oak (Toxicodendron diversilobum). All are members of the Sumac family (for more on the Anacardiaceae see: http://mother-natures-backyard.blogspot.com/2014/12/plant-of-month-december-lemonadeberry.html. 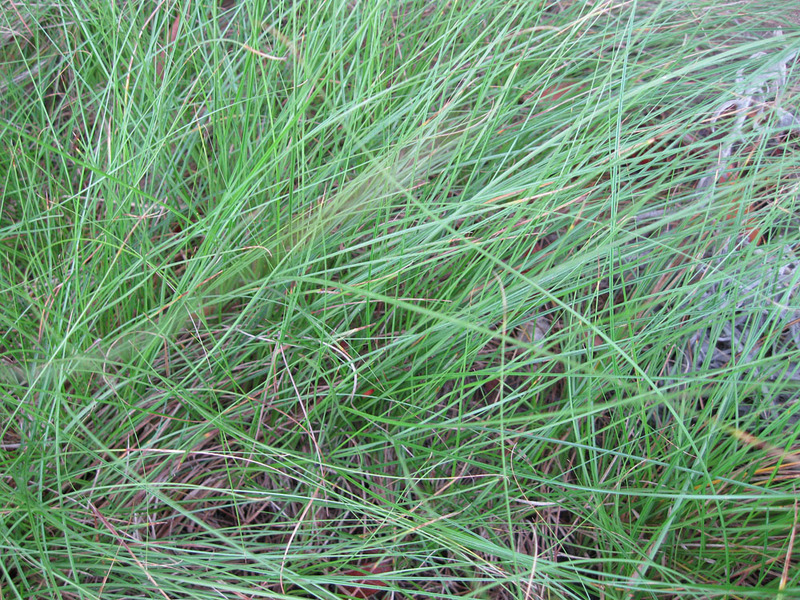 Like many other plants, the taxonomy of this species is currently being revised. Previously, Rhus trilobata was considered a western N. American species; Rhus aromatica was viewed as a related eastern species. 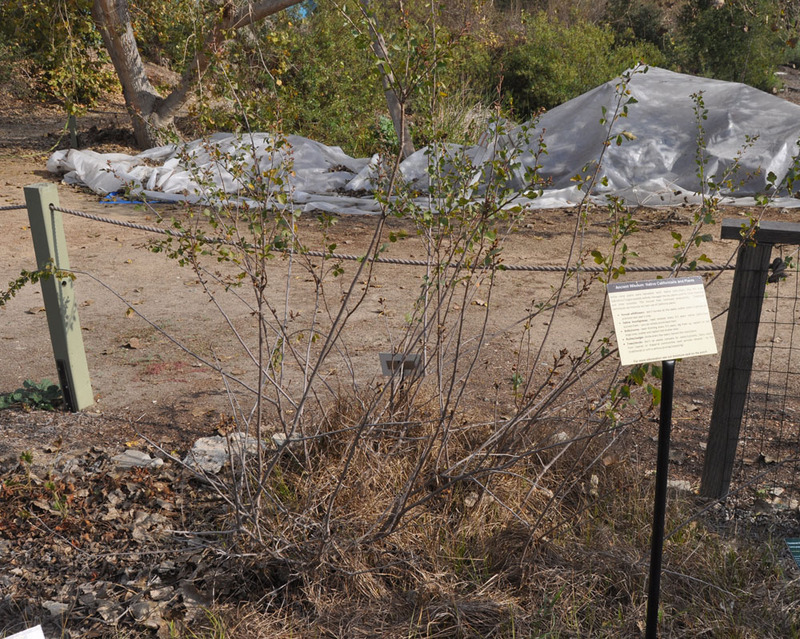 It now appears that both may be the same species (Rhus aromatica), though much of the western literature – and the nursery trade – still refers to R. trilobata. For clarity we’ll use both names, but focus on the natural history of this plant in the West (which is most relevant to California gardeners). Rhus trilobata (aromatica) is native to western North America, from Alberta and Saskatchewan south to Texas and California – even into Mexico. It grows in prairies and shrub lands, on a variety of sites including sandhills, seasonal stream beds, canyons and dry, rocky slopes. In S. California, it can be found in the canyons and washes of interior valleys, in coastal sage scrub, chaparral and southern oak woodland, mostly below 3500 ft. elevation. 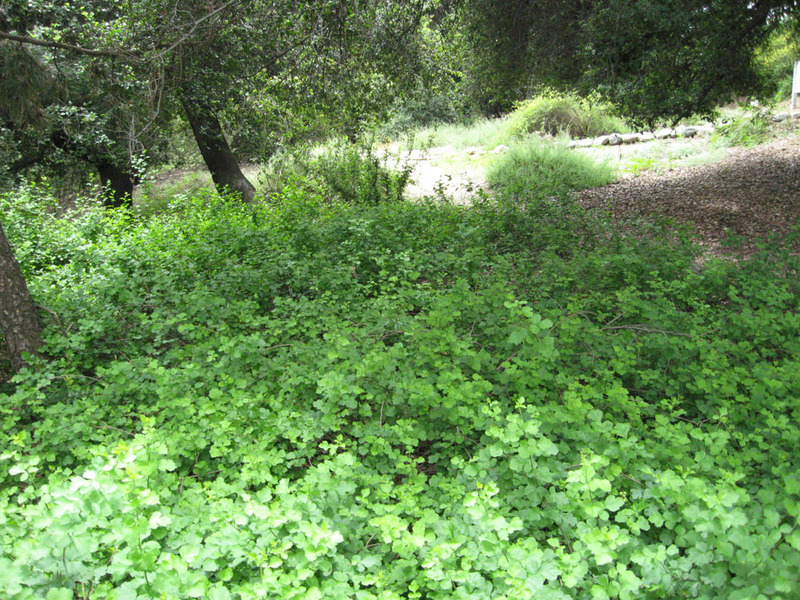 It grows in the Santa Monica Mountains and in the foothills of the San Gabriel Range. 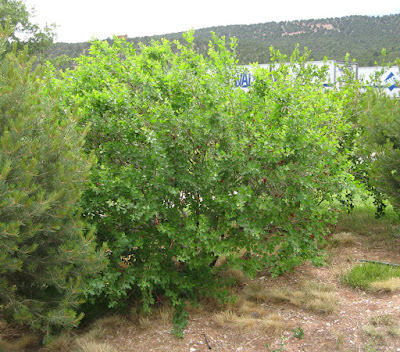 Sourberry is a winter-deciduous shrub that varies in growth habit across its Western range. 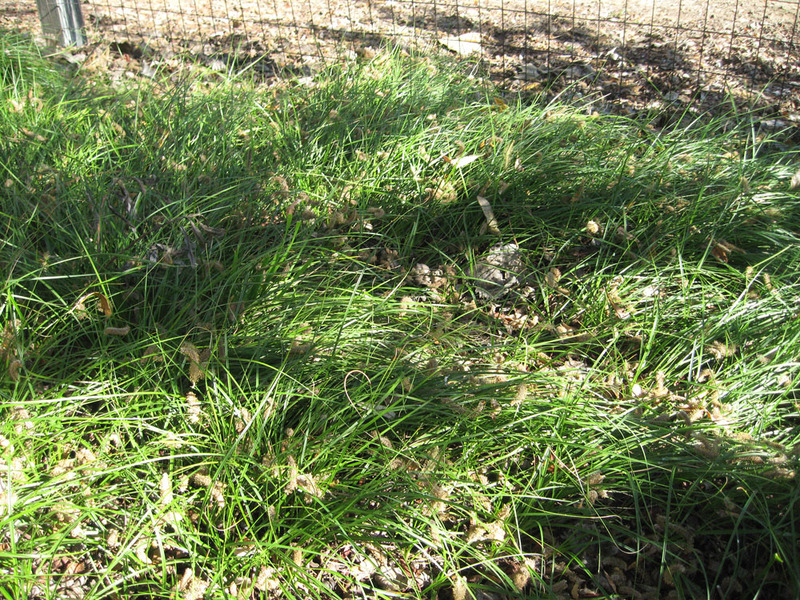 In some situations it’s a low (2-3 ft. tall) mounding groundcover (above). 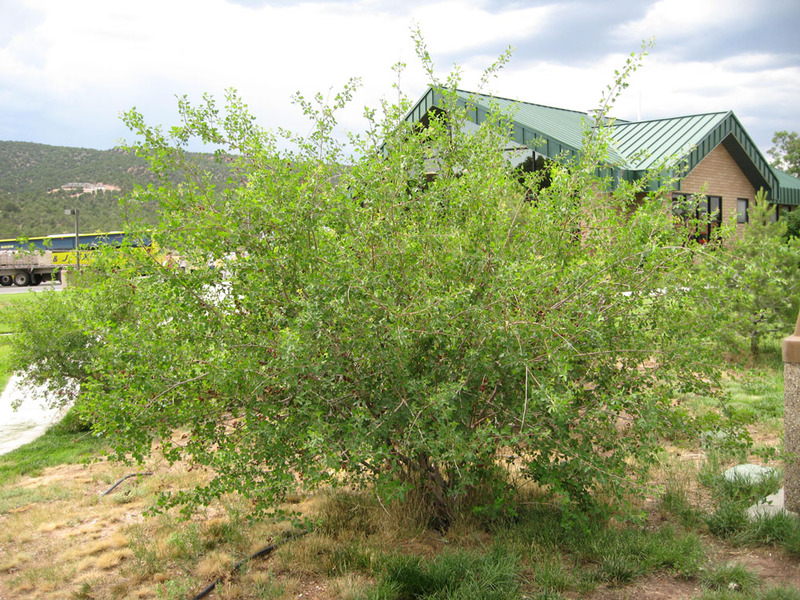 In other places, it grows as a rounded, upright shrub which may reach heights of 6-8 ft. and similar spread (see photo below). 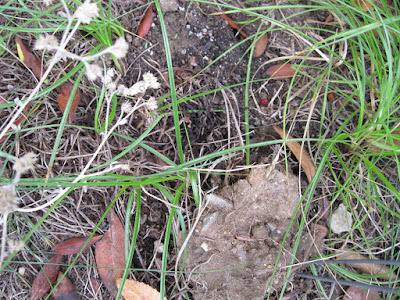 In moist conditions, plants spread by rhizomes, sometimes forming a thicket. 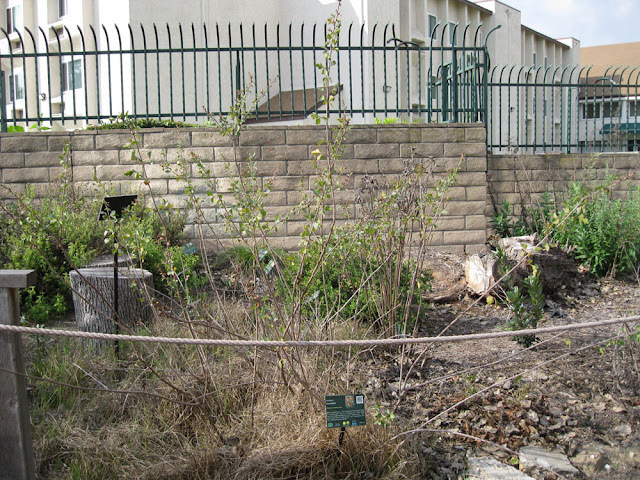 In drier S. California, plants will often remain as solitary shrubs for many years. Plants have a lifespan of perhaps 30-40 years; they grow most rapidly during their first five years. The foliage of Rhus trilobata (aromatica) is medium-green to blue-green most of the year, turning yellow to orange in fall - if temperatures are cold enough. 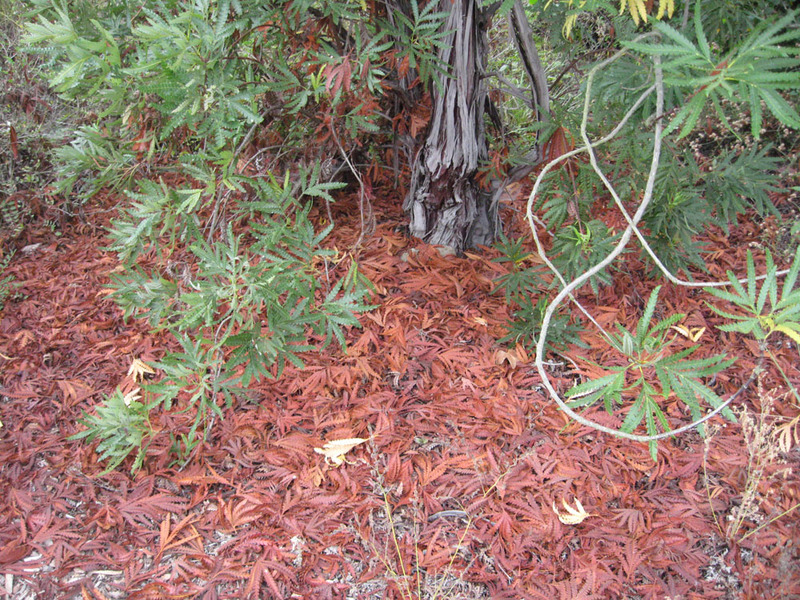 In the western L.A. Basin, fall leaf color is variable from year to year. Plants lose their leaves in fall (usually November in our area) and leaf out again in spring (often as early as February in milder climates). 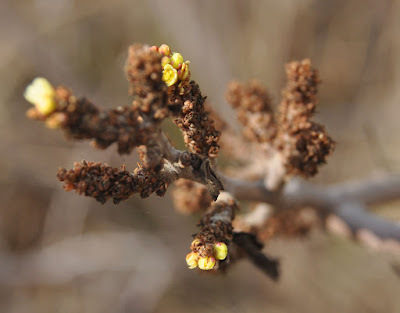 The plants leaf out quickly, from pre-formed leaf buds. Plants often don’t leaf out until after flowering. Sourberry leaves are three-lobed, glossy, leathery, 1 to 1 ½ inches across. They look somewhat like those of Western poison oak (Toxicodendron diversilobum), though not as shiny and a smaller size. 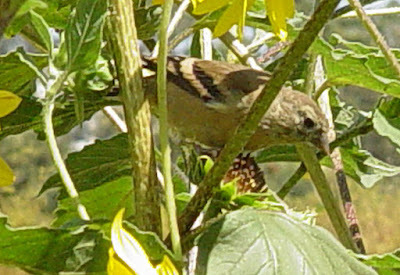 For good pictures comparing the two species see reference 1 (below). The young bark of Rhus trilobata (aromatica) is often a medium red-brown, but may be as light as a pale gray-brown, with pale hairs. Older bark is gray-brown, mostly smooth and fissuring with age. When branches are broken (or leaves are crushed), they release an aroma that is skunky-smelling to some (hence the common names ‘Skunk brush’ and ‘Stink-bush’). 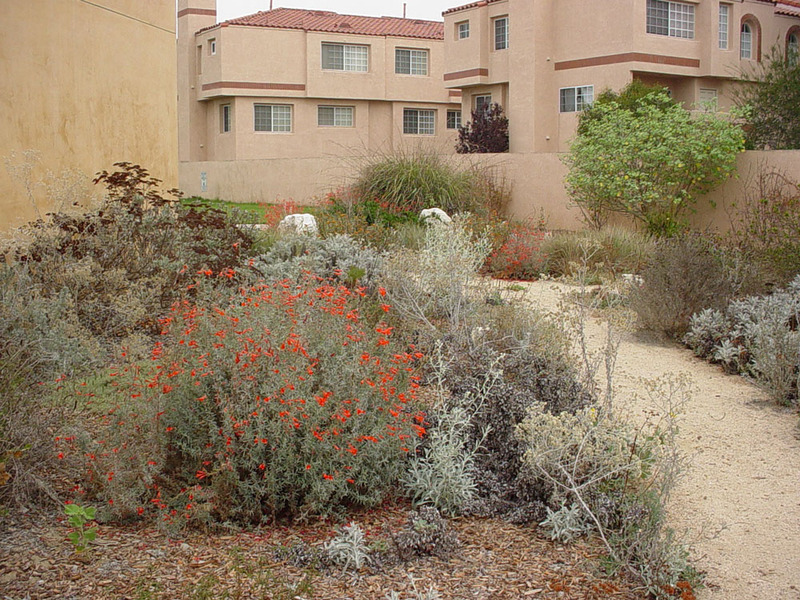 The roots of Rhus trilobata (aromatica) are well-adapted for climates of the American Southwest, including California. Plants have both a deep taproot and a network of fibrous, shallower roots. This combination allows them to make optimal use of intermittent rains, as well as tap into deep groundwater reserves during dry periods. Because of the deep taproot, plants resent being moved once established in the ground. 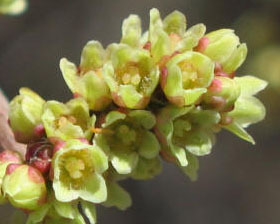 Sourberry blooms in early spring (February-April) in much of S. California, though flowers may appear in winter at lower elevations. 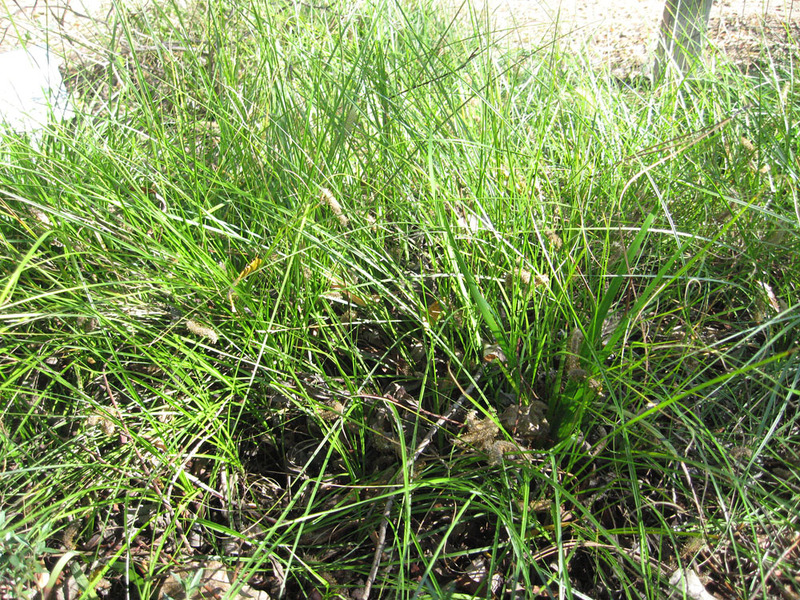 Plants may be dioecious (separate male and female plants). More commonly, plants contain both unisexual and bisexual flowers on the same plant. Male and female flowers are both small (~ ¼ inch across), with yellow petals. Male flowers cluster along yellow catkins (like a willow) and are slightly paler in color, while female flowers occur in dense, brighter clusters at the ends of short branches. 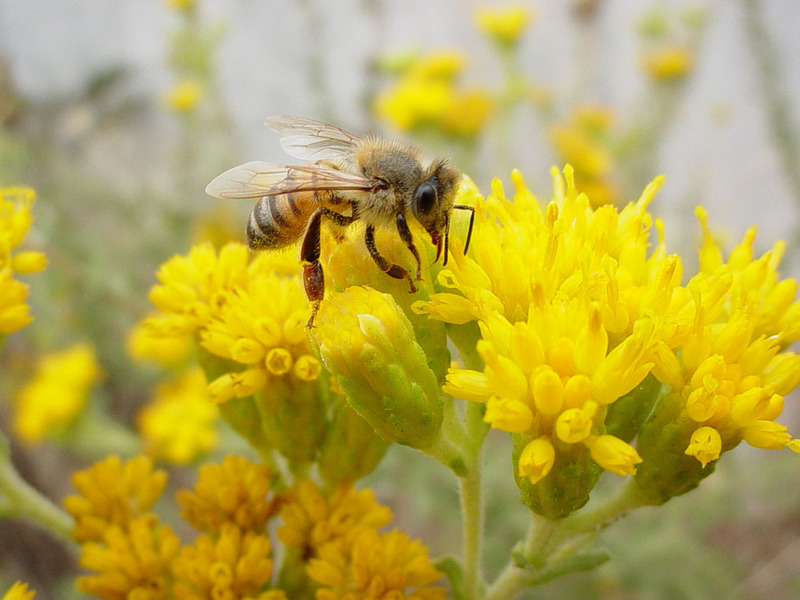 Flowers are primarily bee-pollinated. We’ll try to update our close-up pictures of flowers – hopefully with pollinators - soon. Those familiar with the fruits of Lemonadeberry and Sugar bush will immediately recognize similarities between the three species. The fruits are small (about ¼ inch; 5-7 mm), sticky drupes that contain a single seed with a hard seed coat (a nutlet). Fruits are initially green, becoming a dark red when ripe (see above). 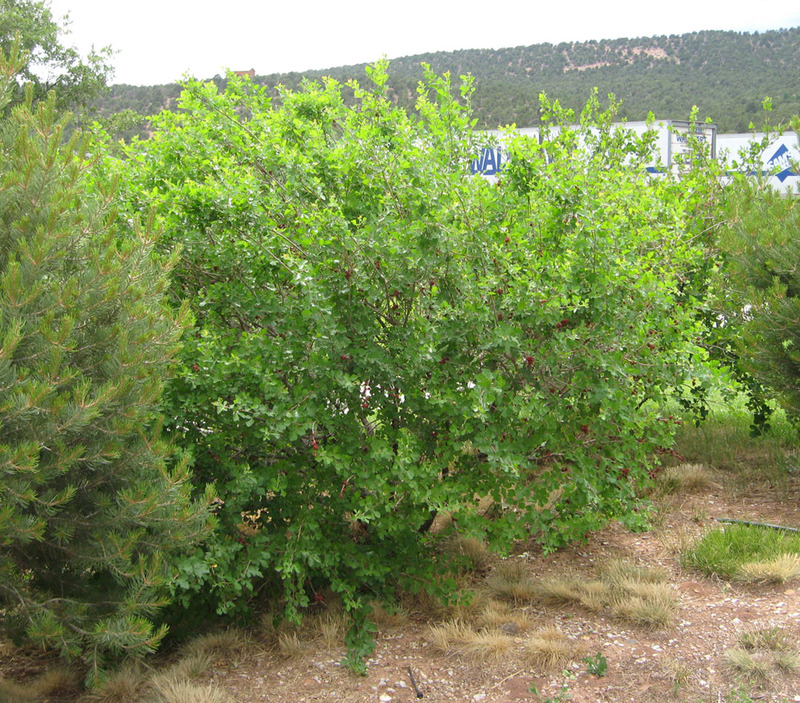 Fruits ripen in late spring/early summer (June/July) at lower elevations in S. California; they may ripen as late as early fall in colder climates. The fruits are loved by birds and animals – including humans! Sourberry (Rhus trilobata/Rhus aromatica) - in garden. Sourberry is an undemanding plant. It tolerates pH from 6.0 to at least 8.0, and grows fine in soils ranging from very sandy to clay. 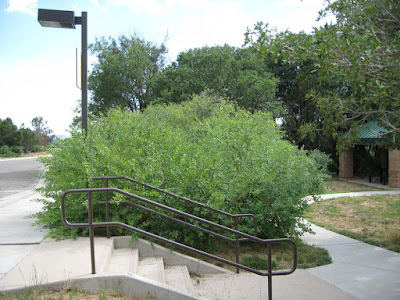 If your soils drain very slowly, consider planting Rhus trilobata (aromatica) on a slope or atop a small berm (it’s intolerant of standing water). 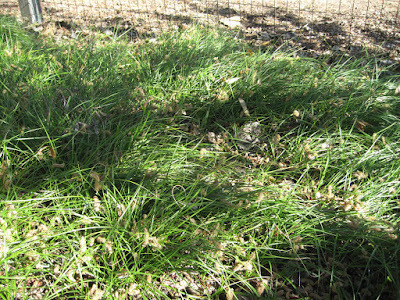 While it can be found growing in full sun, it seems to do better in our area in part-shade. If you have a hot, inland garden, plant it where it gets some afternoon shade. 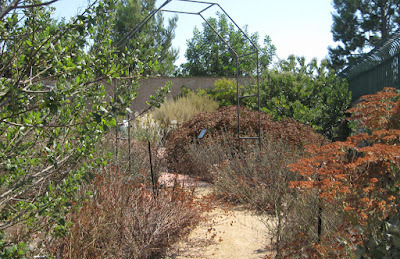 Rhus trilobata (aromatica) is very drought tolerant. However, it looks (and produces) best with occasional summer water. Let the soils dry out between watering, then give the shrub a deep, slow soaking. 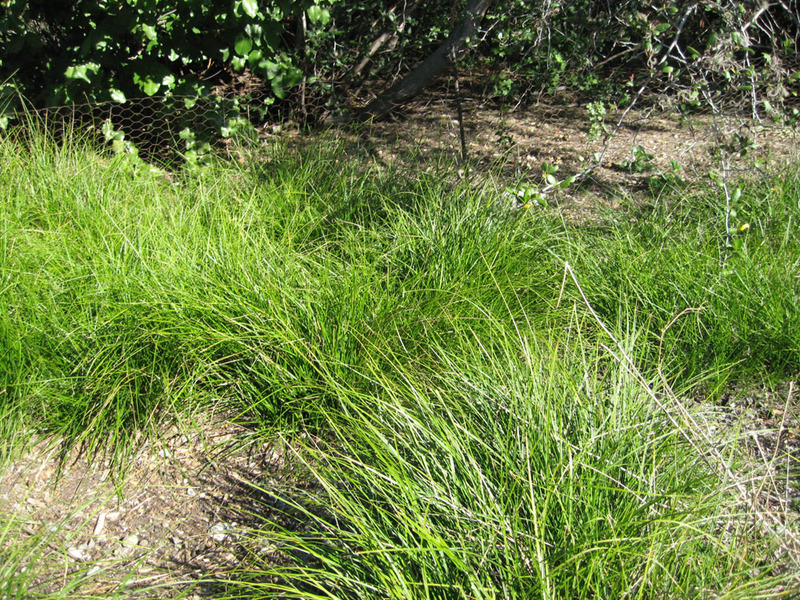 In many areas of the West, this plant experiences occasional summer rains. 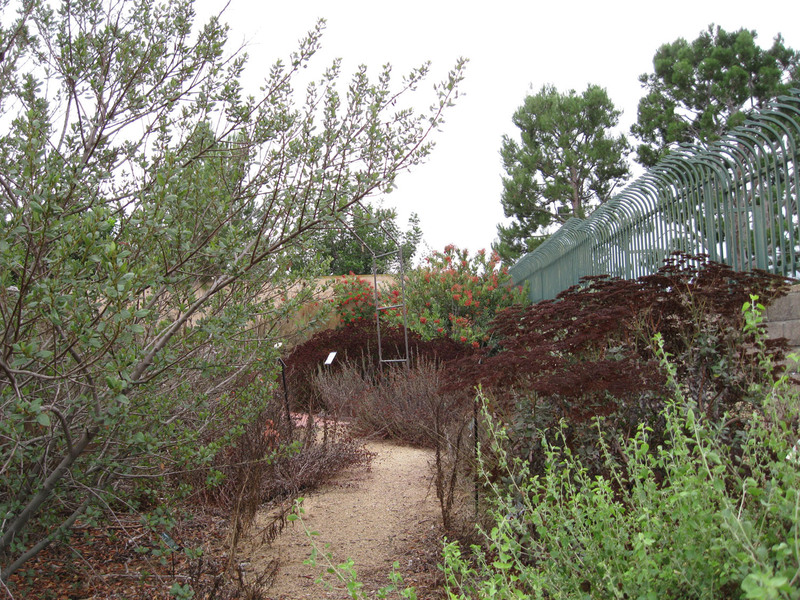 While Rhus trilobata (aromatica) develops a nice natural shape over time, the best-shaped shrubs are given a yearly pruning to stimulate fullness. Branches should be pruned back by ¼ to 1/3 of their length in fall (after leaves fall) or early winter. 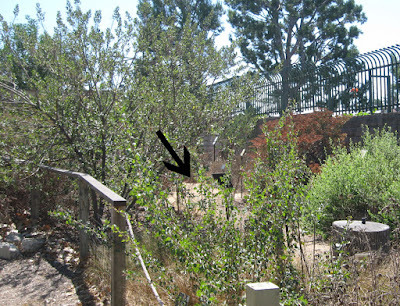 This pruning simulates the animal browsing that shrubs experience in the wild. 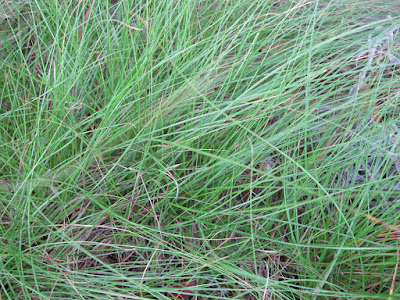 Some individuals are mildly sensitive to chemicals produced by the foliage of plants in this genus. We suggest wearing long sleeves and gloves when pruning (at least until you know you’re not affected). Wash hands/arms after handling the foliage. If you desire straight stems for basket-making or other crafts, you’ll need to cut some or all of the stems back to the ground in early winter (coppice). While native traditions involve cutting or burning an entire stand every few years, we wonder if just cutting back 1/3 of the oldest stems might not work as well. We’ll try this and report back. Sourberry is often used as a large shrub, either shaped or natural, in garden plantings. It contributes to the woodsy, natural look that some gardeners prize. It can also be used as a hedge plant, remembering that it is winter-deciduous. 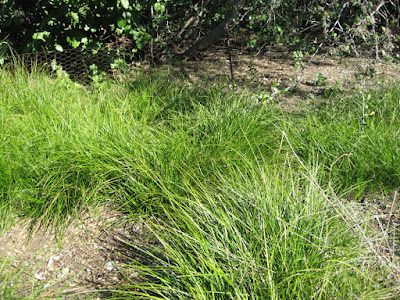 It does well on slopes, often getting by with little supplemental summer water once established. It is widely used for erosion control on slopes and in riparian areas. 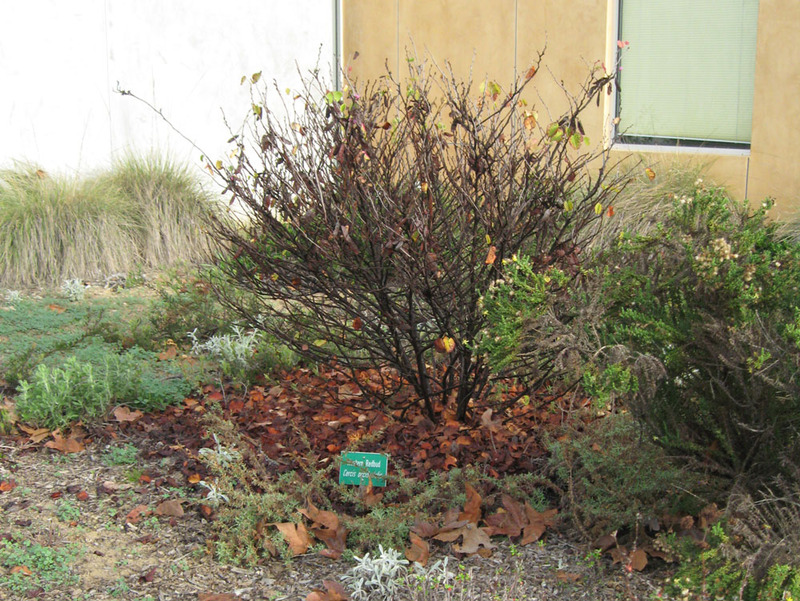 And Rhus trilobata (aromatica) is becoming more common in commercial plantings, due to its drought tolerance and low maintenance. 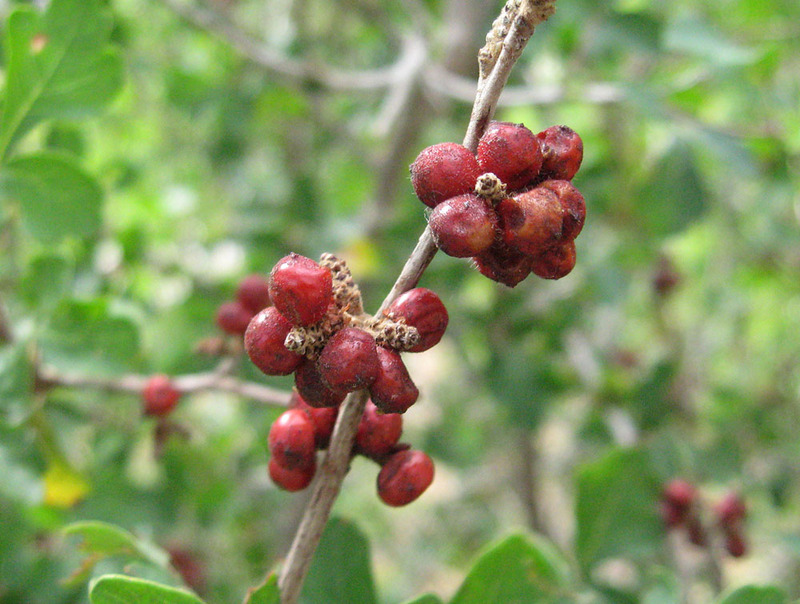 Sourberry can be grown in a large container – even used as a bonsai plant. 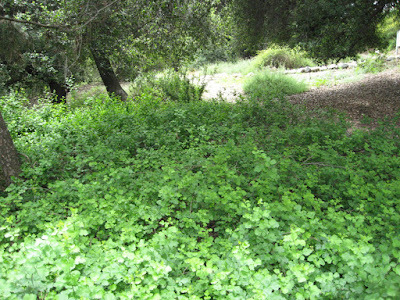 The lower-growing forms are useful as a woody groundcover under trees. The cultivars ‘Autumn Amber’ and ‘Gro-low’, which are available commercially, grows less than 2 ft. tall, and are popular as groundcovers. cover. Rancho Santa Ana Botanic Garden, Claremont, CA. 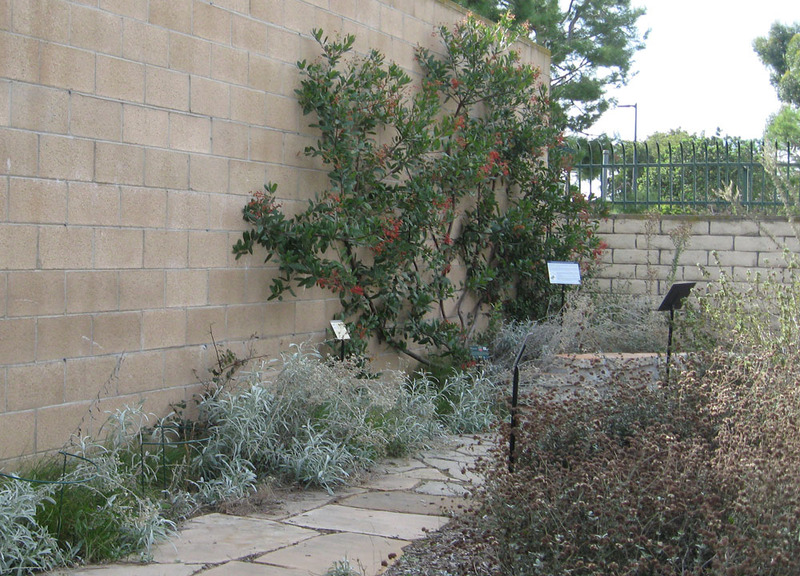 Of the many shrubs planted in S. California gardens, Rhus trilobata (aromatica) has some distinct advantages. 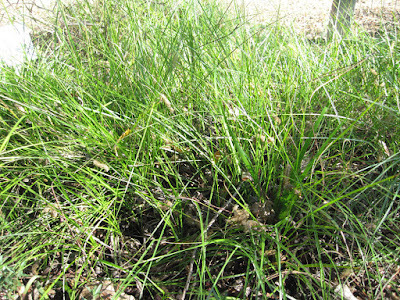 First, it is a great habitat plant. 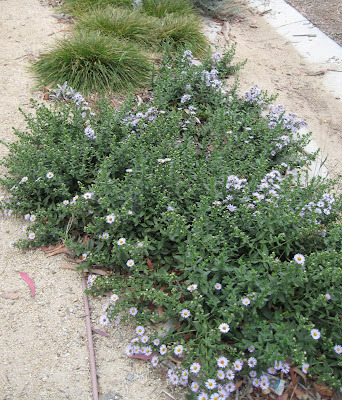 Its size, many small flowers, dense foliage and edible fruits make this a good choice for bird and insect habitat. If you don’t use the fruits yourself, don’t worry; plenty of fruit-eating birds will be glad to remedy the situation. If you are a basket-maker, planting Rhus trilobata (aromatica) insures a ready source of the straight stems needed for your craft. This has always been an important basketry plant, wherever it grows. If you need it for your craft, grow it. Sourberry, along with the other local Rhus species, is also a useful plant for the natural dyer. Leaves, prunings, ashes and fruits can all be used to mordant yarn or fabric prior to dyeing. 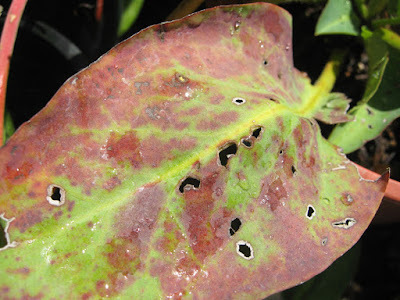 The plants are high in tannins, and tan-brown dyes can be obtained from leaves, bark and roots; pink-tan dyes are possible from the fruits. 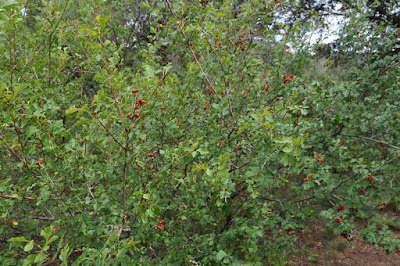 Fruits of Rhus trilobata (aromatica) were traditionally sucked or chewed as a treatment for toothache, mouth sores or as a mouthwash. Fruits ease the pain, in part due to their astringent chemicals. A decoction of the fruits is also traditionally used for stomach problems, as well as a hair tonic. The leaves are astringent, diuretic, emetic and hemostatic; infusions made from leaves have several traditional uses, including to treat head colds and soothe skin itches. Dried, powdered leaves have been used to create soothing salves for mouth sores. For more traditional uses of this plant see reference 3, below. 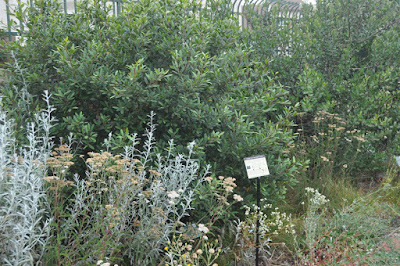 In summary, Rhus trilobata (aromatica) is a shrub with much to recommend it. We’re surprised is isn’t used more often in the garden setting. So if you’ve got the space – even room for a large pot – you might want to consider this pretty and useful native. 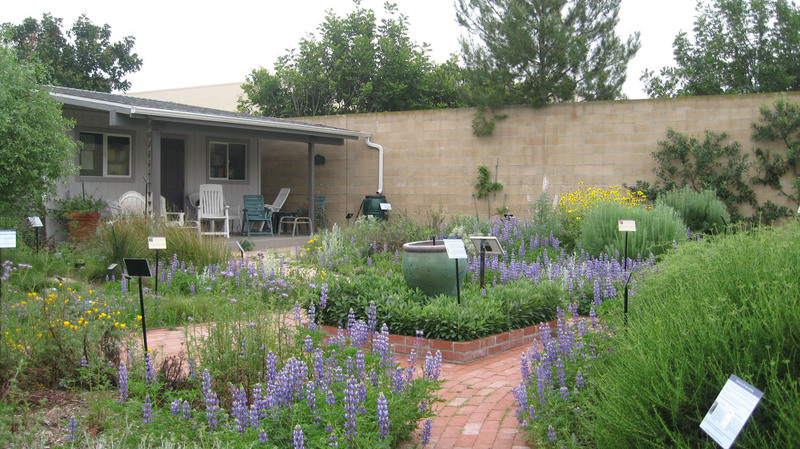 There are many gardening myths about California native plants (http://www.slideshare.net/cvadheim/california-native-plant-myths-2014). 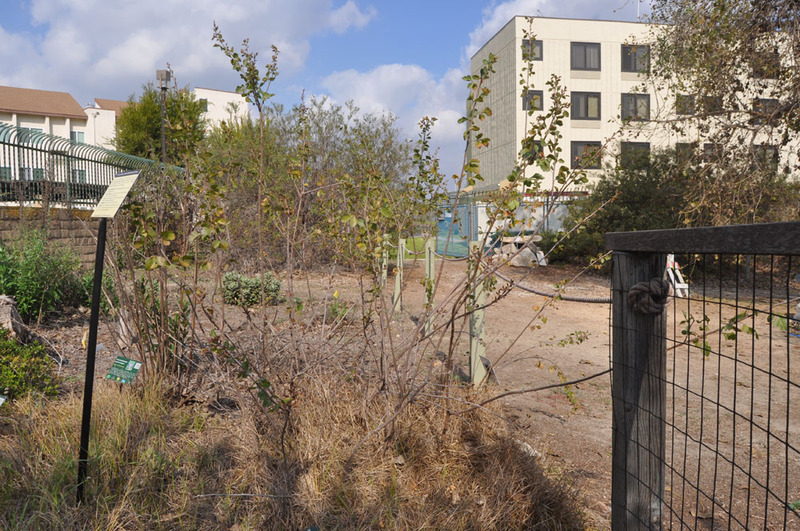 One is that ‘all California native plants turn brown in the fall’. 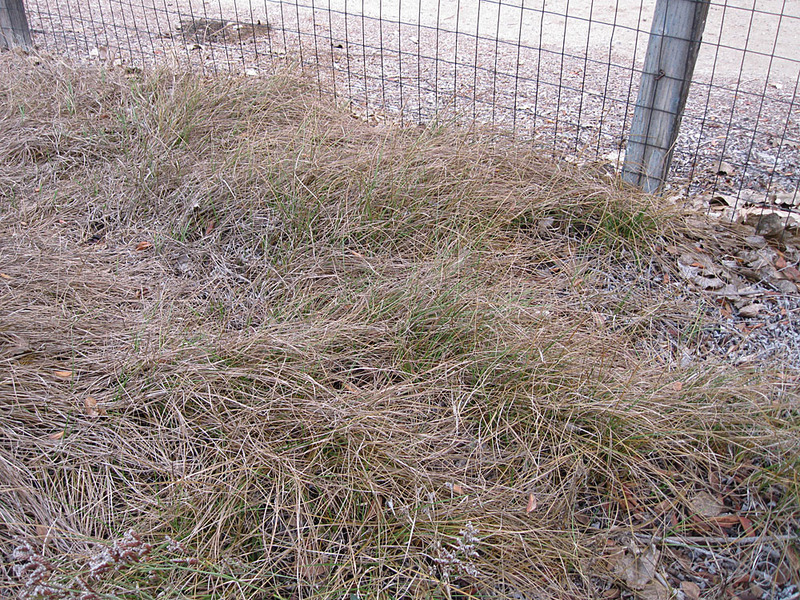 Some certainly do – dry season dormancy is a great way to survive our hot, dry summers. But a number of natives are evergreen, or bloom and fruit in fall. The trick to an interesting fall garden is to choose plants specifically for fall color. Most people picture brightly colored leaves when they think of fall color. If you live in a cold climate, bright leaves do define the fall landscape. But fall color in mediterranean gardens is a little more subtle. It actually involves more choices – and greater sophistication - than just ‘planting a maple’. 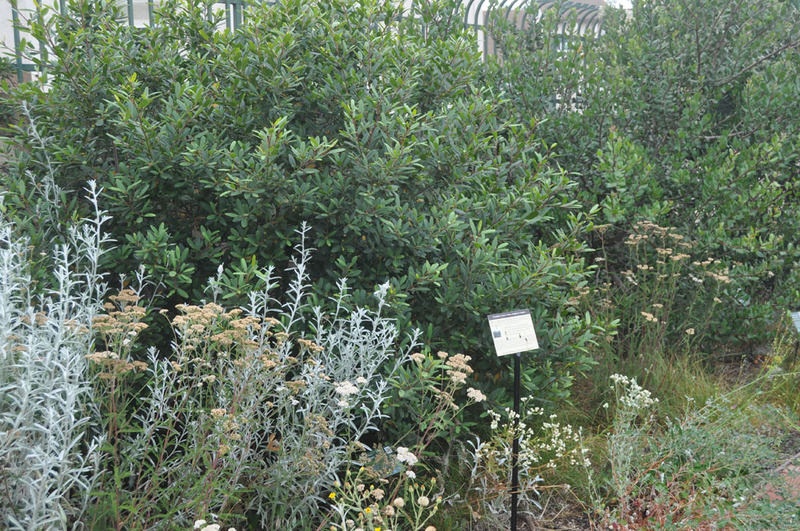 One trick to an attractive S. California fall garden is to plant some evergreen plants. We particularly like the water-wise, evergreen native shrubs. 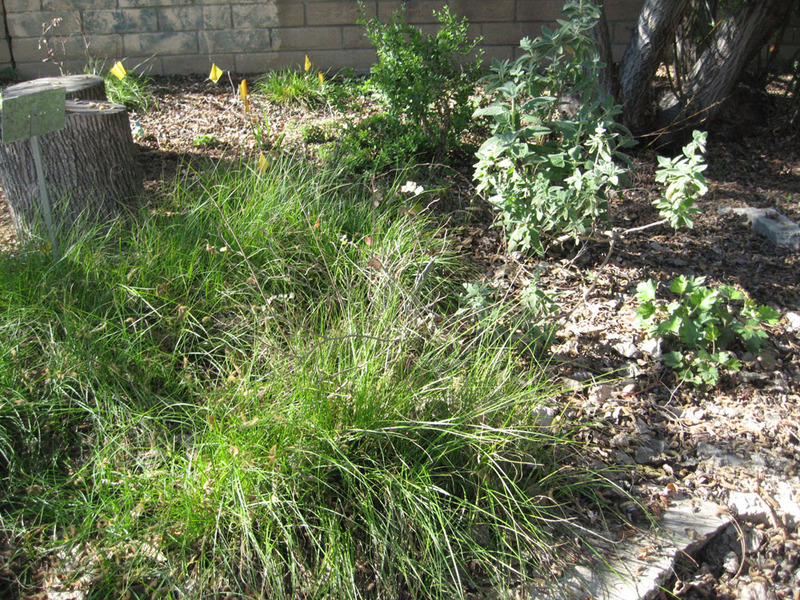 But any evergreen plants will do – grasses, sedges, rushes, groundcover perennials, etc. Green foliage looks cool and refreshing; that’s reason enough to include it in a California garden. But evergreen shrubs, particularly the larger ones, also provide the perfect backdrop for fall color. A garden is like a theatrical stage. The colorful flowering plants – and those with unusual shapes and foliage – are the actors (‘accent plants’). But actors, whether human or plant, need a stage on which to perform. And an important component is a backdrop that accentuates their colorful attributes. Large evergreen shrubs are another alternative. Whether individually, or as a large hedge or hedgerow, shrubs with medium-to-dark, evergreen leaves provide the perfect background for fall-blooming plants. We’ll talk more about hedges and hedgerows next month (November, 2016). If you want a garden filled with fall leaf color, you’ll need to move some place with a colder climate. While day length triggers the color changes, cold fall nights really promote the bright reds and oranges. For more on how leaves change color, see references 1-3, below. 'Roger's Red' grape has spectacular fall leaf color! 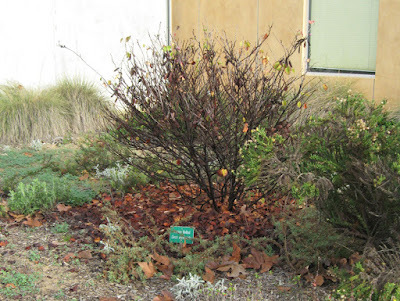 A few native shrubs and vines produce red or purple foliage color in fall/winter in lowland S. California. The most reliable is ‘Roger’s Red’ grape, which yields vivid, red-purple leaves - even in warmer, coastal gardens. With its colorful leaves and dark, edible grapes, ‘Roger’s Red’ is the closest we get to ‘brightly colored fall leaves’. In full color, it’s a sight to behold! can be quite colorful in fall. 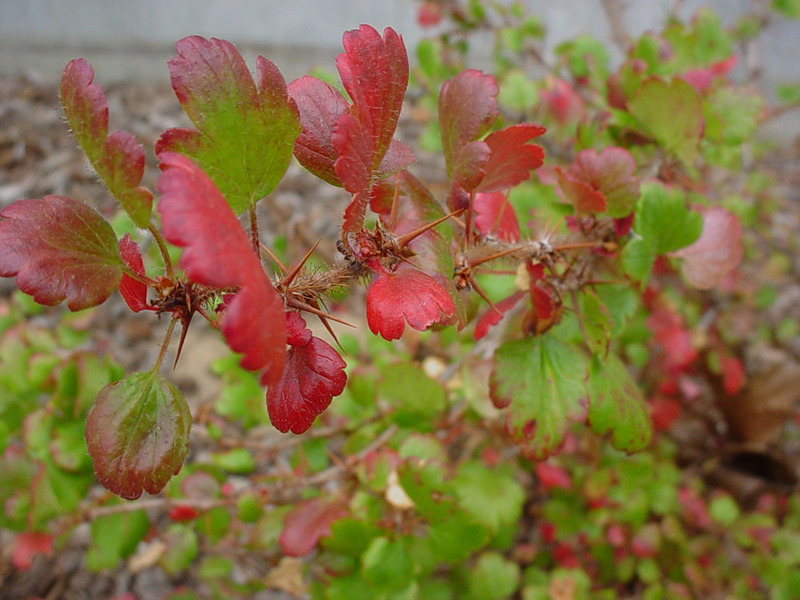 A few other native shrubs are known for their red leaf color. Although evergreen, Oregon grape (Mahonia/berberis aquifolium) and other Mahonia and Berberis species produce some red-purple leaves, if the fall/winter is cold enough. As our fall/winter temperatures increase, they are becoming less reliable sources of color in western Los Angeles County. So, too, are the N. California maples, including the Vine Maple (Acer circinatum) and the Prunus species (like Western chokecherry - Prunus virginiana var. demissa). These can produce spectacular color, but only if the conditions are right. 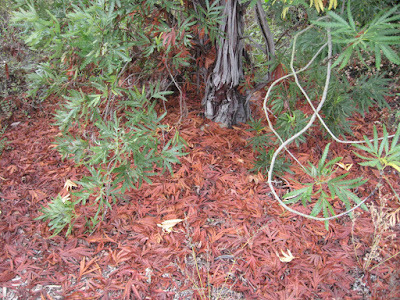 Lyonothamnus species make their own colorful mulch in fall. 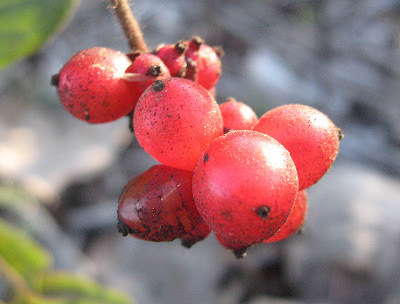 Sourberry (Rhus trilobata) has red-orange fall leaves, and the native Dogwoods (Cornus glabrata; Corus sericea) are known for their red-brown leaves and bark. Fallen leaves of the Island Ironwoods (Lyonothamnus floribundus) and Western redbud (Cercis occidentalis) create a striking red-brown mulch in the fall. And the fall hues of the medicinal perennial/groundcover, Yerba Mansa (Anemopsis californica), are enchanting. 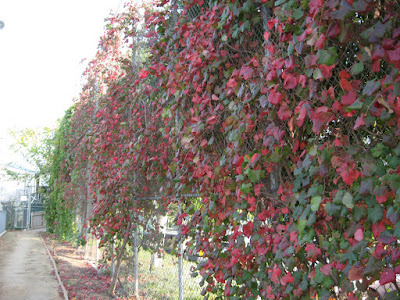 These are the fall reds of S. California; unique touches of color found in few local gardens. in the dry days of fall. If you really want red-orange leaves, you may need to select a non-native tree. A common choice in S. California is the Sweetgum (Liquidambar styraciflua), with its reliable red and orange color. Crepe Myrtles (Lagerstroemia species) produce yellow to orange fall leaves. We’ve also enjoyed the fall color and fruits of ‘Anna’ apple and other low-chill apples (Malus domestica species), Asian pears and pears (Pyrus species and cultivars). These can easily be grown along with native plants with similar water requirements. Some S. California natives produce good yellow colors in fall. Best known are riparian trees like the native willows (Salix species) and Cottonwoods (Populus species), Western sycamore (Platanus racemosa), Boxelder (Acer negundo) and the Southern California Walnut (Juglans californica). All are large trees; in fact, most are too large for typical suburban yards. 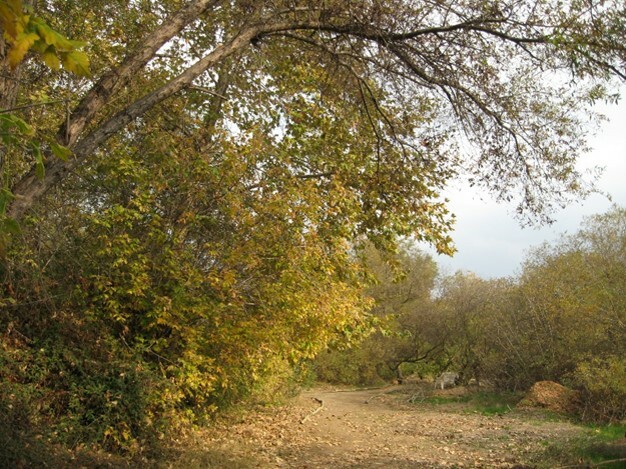 The willows and cottonwoods have water-seeking roots (invade water & sewage pipes). All of the above are also susceptible to the destructive Polyphagus Shot Hole Borer, a serious emerging pest of wildlands, parks and gardens . 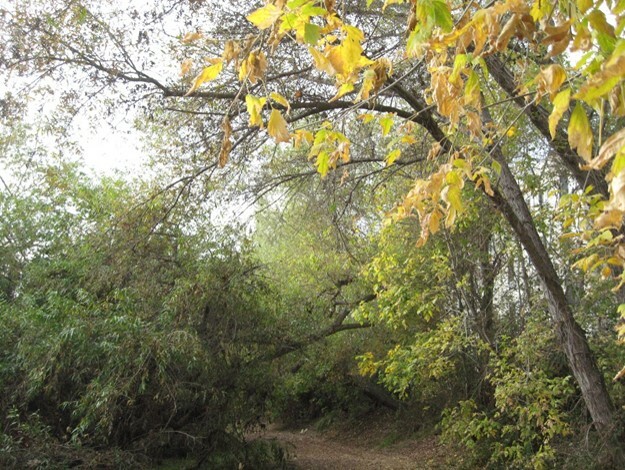 Several other winter-deciduous native trees/shrubs turn yellow or yellow-orange in fall. These include the Blue elderberry (Sambucus nigra ssp. cerulea), Western redbud (Cercis occidentalis), the native Ashes (Fraxinus dipetala; Fraxinus velutina), California mock orange (Philadelphus lewisii) and the wild roses (Rosa species). These can be better choices for home gardens, although their colors are not as bright or reliable as the riparian trees. While cold-climate areas excel at fall leaf color, our local native plants surpass them with fall flowers, fruits and seeds. Cold climate gardeners envy our long fall growing season and color palette. 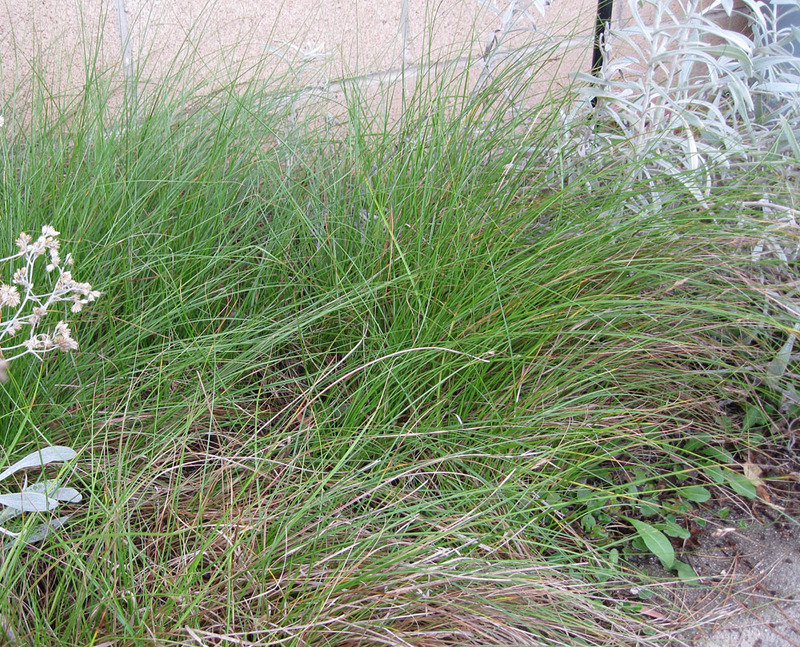 Some local native plants are at their best in the shorter days of fall. Shrubs in the Sunflower family provide the most spectacular fall yellow and gold flowers. If you love yellow, fall is a good season! At the pale end of the spectrum are Mulefat (Baccharis salicifolia) and Coyote bush (Baccharis pilularis). Most of the rest have brilliant yellow-gold flowers in abundance. Among the best are the larger Goldenbushes (Hazardia species and Isocoma menziesii), the mid-sized Rabbitbush (Ericameria nauseosa) and other Ericameria species and the smaller Butterweed (Senecio flaccidus var. douglasii), Matchweed (Gutierrezia californica), the Goldenrods (Solidago species) and Telegraph plant (Heterotheca grandiflora). The tall Annual sunflower (Helianthus annuus) may also bloom in the garden setting in fall. The fiery flowers of Epilobium are a fall treat! 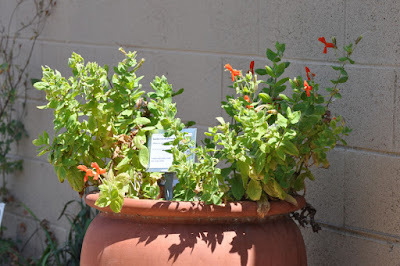 If red and orange flowers are more to your taste, you can’t go wrong with the California fuschias (Epilobium canum and other Epilobium species). California fuschia and its cultivars are prized with good reason. They come in colors ranging from white to brilliant red. They are bright, colorful, water-wise and produce lots of fall blooms in a good year. Epilobiums are a good, low maintenenace investment. 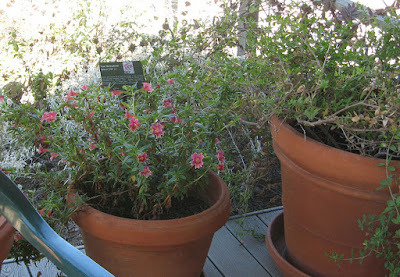 Mimulus cardinalis often blooms again in fall. 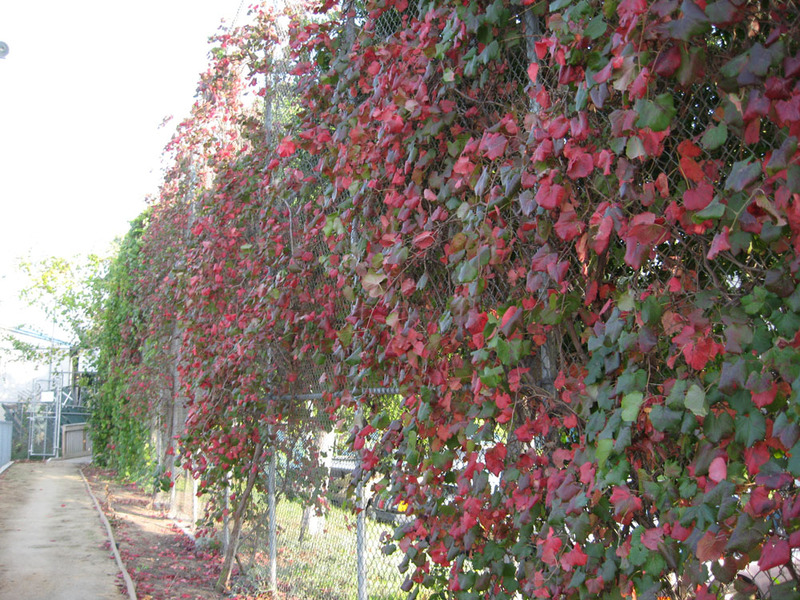 Diplacus species and cultivars are also good for fall color. Several red/orange flowering plants may bloom again in fall, including the Baja fairyduster (Calliandra californica), Catalina snapdragon (Gambelia speciosa) and Chuparosa (Justicia californica). The Scarlet monkeyflower (Erithranthe/Mimulus cardinalis), the shrubby perennial monkeyflowers (Diplacus species and cultivars) and the Monkeyflower savory (Clinopodium mimuloides), all of which like a little shade and water, also come to life again in fall. If you need a colorful porch pot, these are a good bet for late summer and fall. 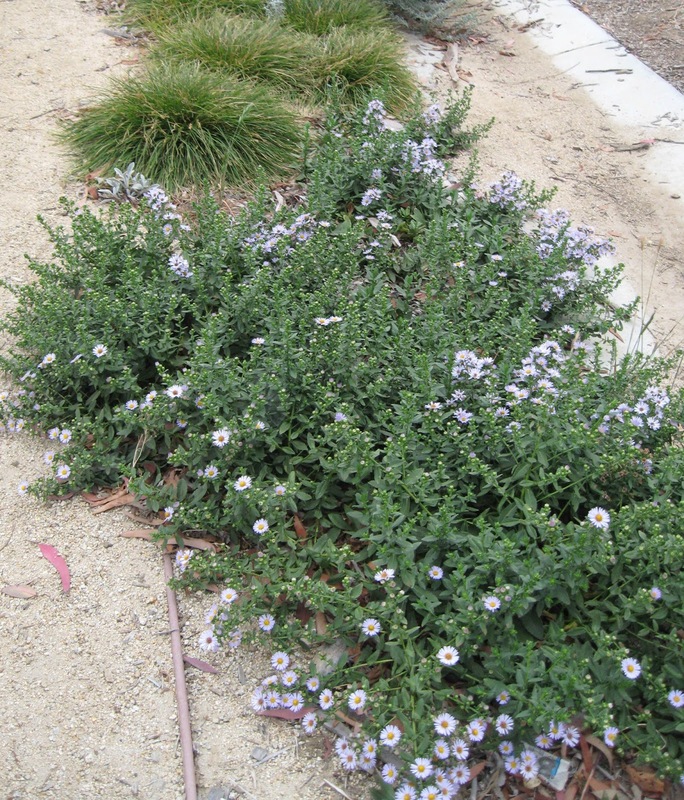 The most reliable purple flower of fall is the Coast aster (Symphyotrichum chilense (Aster chilensis)), useful as a ground cover or pot plant. Pink-blooming fall natives include the spectacular Sweetscent (Pluchea odorata) and Arrowweed (Pluchea sericea). For scent, plant the Brickelbushes (Brickellia species); their sweet fragrance at dusk is a welcome addition to the fall garden. Some of our most spectacular fall color comes from seeds, seed heads and fruits. At the top of the list for seed color are the native Buckwheats (Eriogonum species). While some buckwheats bloom into fall, most are going to seed. And oh, what a show they create! Colors range from pale brown to rust and dark brown. The seed heads may be small and round or large and flat, depending on the species. They add color and interesting shapes from summer through fall. If you want a colorful fall garden, plant several species of native Buckwheat. They are easy to grow, water-wise, and excellent pollinator and bird habitat. They will become the backbone of your fall garden. They are local treasures! And then there are the colorful fruits of fall. 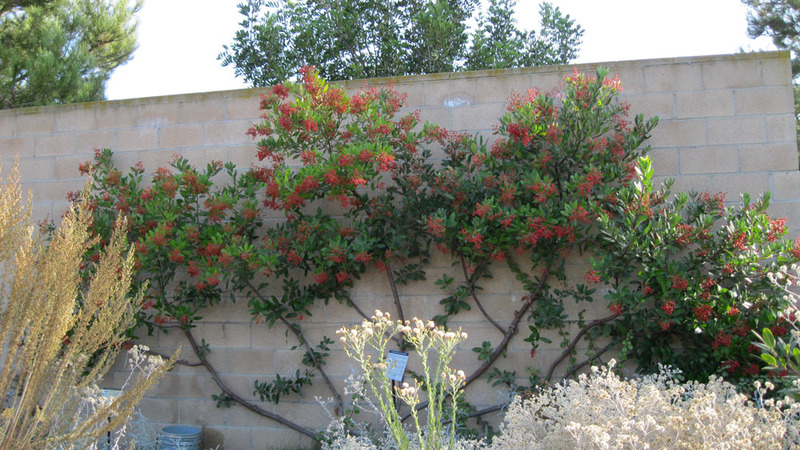 The most showy – and well-known – are the red fruits of the Toyon (Heteromeles arbutifolia). 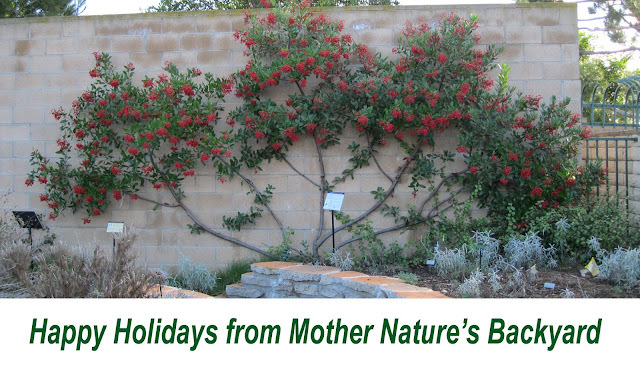 Another common name for this large shrub is the California Christmas berry. With climate change, we may have to rename it 'Halloween berry' – it’s coloring up earlier every year! The fruits provide spectacular color, as well as food for fruit-eating birds. Toyon makes a spectacular espalier along a wall. 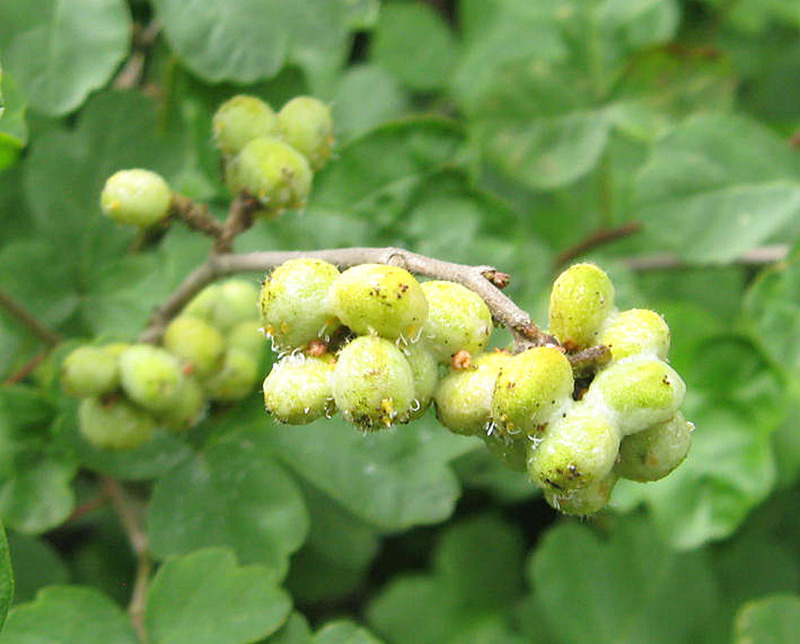 Native wild grapes are edible and showy. 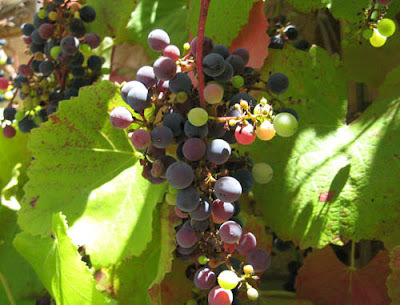 Native grapes ripen in late summer or fall. The dark fruits contrast beautifully with the fall leaf color (red or yellow). 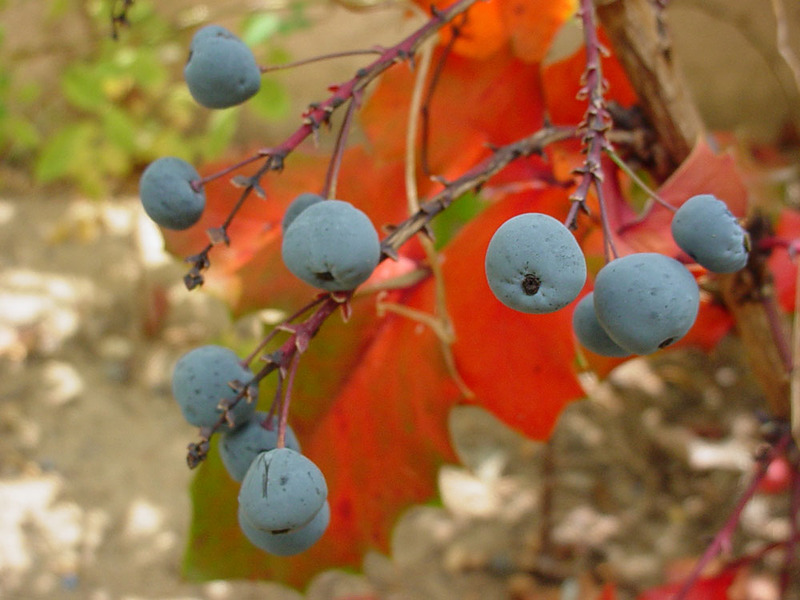 Other native shrubs may still have colorful fruits in fall. 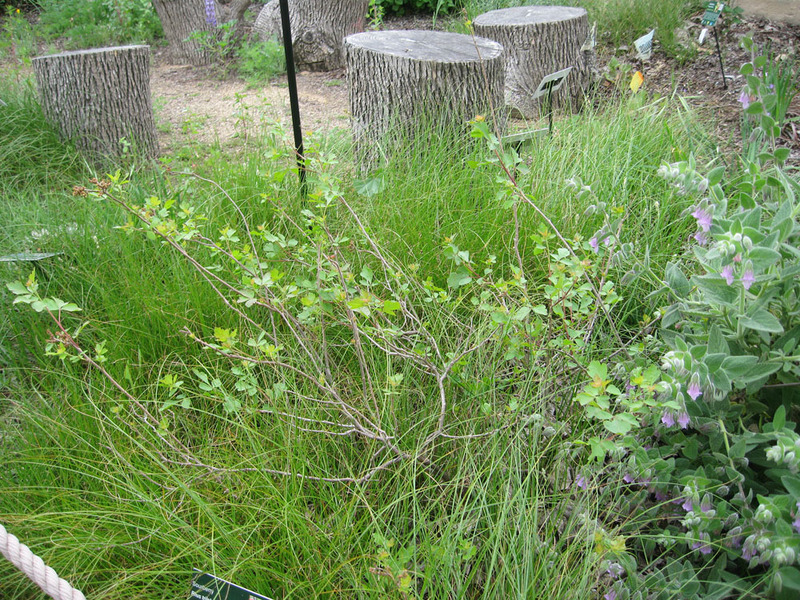 These include the native currants and gooseberries (Ribes species), Western chokecherry (Prunus virginiana var. 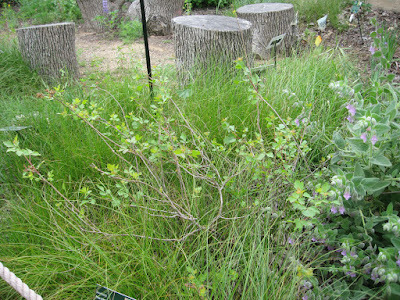 demissa), Netleaf hackberry (Celtis reticulata), Summer holly (Comarostaphylis diversifolia ssp. planifolia), California coffeeberry (Frangula/Rhamnus californica) and Silver buffaloberry (Shepherdia argentea). Of course, the non-native persimmons and pomegranates are also spectacular (and delicious) in fall. Native honeysuckles (Lonicera species) have showy berries. We hope we’ve inspired you to plan a little color for your fall garden. Southern California’s native fall color is different from that of New England, but it is every bit as lovely. The peaceful colors of a local fall garden are soothing and restful; they fit in with the landscape. And while the colors don’t jump out and grab you like the reds of a fall maple, they are beautiful in their own right. Savor them like a fine wine; they are part of our California natural heritage.